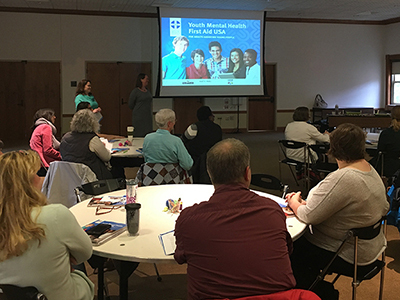 Sharon Custer and Erin Paternite Eakin (standing, left to right) lead a Youth Mental Health First Aid Training session. The CSBMHP has expertise in providing supportive technical assistance services to local elementary, middle, and high schools, and to community mental health and substance abuse agencies. Our technical assistance includes evaluation services, such as conducting needs assessments, developing and/or identifying programs based on recognized needs, conducting program impact and outcome evaluations, and developing plans for sustainability of effective strategies. In addition, we have expertise in supporting organizations' efforts to obtain grant funding, including assistance with grant-writing, grant evaluation services, and research-based summaries of the current best practices that bridge the gap between the pragmatic world of practice and academic-oriented world of research. We also can assist with the development and/or revision of policies and procedures that relate to non-academic barriers to learning, such as anti-bullying policies, disciplinary procedures for problematic behavior, and state mandates. The CSBMHP can assist your organization in conducting needs and resource assessments to help you identify any current social, emotional, and/or behavioral concerns among your key stakeholders, as well as identifying any gaps in services that may exist within your organization. We can also help analyze any pre-existing data sources that you may have, including results from surveys that have already been conducted or information in databases. We can provide you with research-based and evidence-based options for programs, strategies, and techniques that can fill the identified need, and assist you throughout the implementation process. To ensure that your adopted strategies are achieving your desired outcomes, we can assist with the development of an evaluation plan that will include impact assessments, outcome evaluations, and fidelity measures. Our technical assistance will ensure that you develop a full understanding and appreciation of this data, and are able to use it for future purposes (e.g., to communication to stakeholders, to use in grant applications, to enhance the services/programs). We can also assist you in developing a pragmatic plan for sustaining your efforts over the long-term to ensure that successful efforts continue. Many organizations have extensive data that has been collected through a variety of means. Unfortunately, much of that data is not used to the full extent that it could be. We can assist organizations with analyzing and interpreting those data points, and developing a plan to use that data to inform other decision that are being made within the organization. We can teach this data-driven process to your internal staff so that your organization has sufficient internal knowledge to continue this process over the long-term. The CSBMHP can assist you with your grant needs. We have expertise in grant-writing and can assist you with writing narratives, evaluation plans, budgets/justifications, and/or supporting documentation. In addition, if you have the need for evaluation services through the grant project, we have served as evaluation consultants on a number of other grants and may (if time permits) have the ability to do so for your project. If you have the need for research-based background information to help support your narrative, our staff can assist with the development of summaries based on the latest research in the specified area. Our staff can assist with policies/procedures development projects. There are many federal and state mandated policies that schools must develop and adopt (e.g., ESSA). For example, schools in Ohio are required to develop anti-bullying policies (H.B. 276) and include cyberbullying/school-bus bullying (H.B. 116). We can assist you in the development and/or revision of your policies regarding these areas. In addition, we have expertise in the development of behavioral disciplinary rubrics and procedures for addressing problematic behaviors. We can also assist with behavior management plans, whether at a classroom or individual student level. The CSBMHP is focused on developing strong prevention and intervention techniques and strategies to address non-academic barriers to learning, and thus enhancing students' abilities to succeed. The CSBMHP currently has staff members that are certified trainers in the following programs. The CSBMHP is committed to providing high quality, research-based professional development training opportunities for school professionals, community mental health professionals, and families/youth. We offer both continuing education workshops and trainings (CEUs offered through various professional boards such as Social Worker, Counselor, & Marriage and Family Therapist Board, Ohio Psychological Association, and Ohio Chemical Dependency Professionals Board- among others) and graduate-level classes (Miami University graduate credit). We can create tailor-made professional development training programs based on your site's individual needs.